A wonderful urban love story tells the story of Jamie’s relationship with classmate Ste and his loud mouthed mother Sandra. Written by Jonathan Harvey who wrote the hit TV series Gimme Gimme Gimme and currently many episodes of Coronation Street, this affectionate comedy is full of warmth and honesty as the two boys find love accompanied to the inspiring tracks of Mama Cass. Their relationship has surprising effects on Sandra, her hippie boyfriend and a very inquisitive neighbour. The stage version was made into a highly successful film in 1996 and has recently been successfully revived in London and on tour. BEAUTIFUL THING, Jonathan Harvey?s play about deprived adolescent boys who fall in love with one another, is ideal for the intimate setting of the Garrrick?s Lauriston Studio. ?Whatever form it takes love is an unexplained passion which hits unexpectedly and overwhelmingly. Next door neighbours, Jamie and Ste feel these emotions, even though they are only 16, yet they are terrified of being dubbed ?queers? on the Council estate where they live. ?Streetwise neighbour Leah fancies Ste even though she realises he isn?t interested in girls. ?The boys? relationship might never have flourished were it not for Jamie?s mum, Sandra, allowing Ste to share Jamie?s bed after he is beaten up by his father. ?Sandra, a bar maid of the year is played by Sarah Roberts with warmth and a toughness which disguises her fragility. Her character is hardly a Madonna but her motherly love is undisputed. ?Her sleezy boyfriend, Tony, is played by Joseph Morgan making his Garrick debut in his first straight play. ?The boys, played by Charlie Gallagher and Dillon Burgess are invincible. The actors are young enough to remember adolescent pangs and capture perfectly the hopes and anxieties of growing up. They illustrate the initial hesitancy as their characters? relationship blossoms and their remorse when it is discovered. ?There is an unforgettable scene when, high on drugs, Alexandra O?Neill?s girl next door, Leah, impersonates the star using an egg whisk as a microphone, temporarily becoming the star of the show herself. ?Trevor McKie?s and Margaret Norris?s set makes good use of the small stage to illustrated the three adjacent flats. Beautiful Thing, performed in the Garrick?s intimate Lauriston Sudio, is, indeed, beautiful. 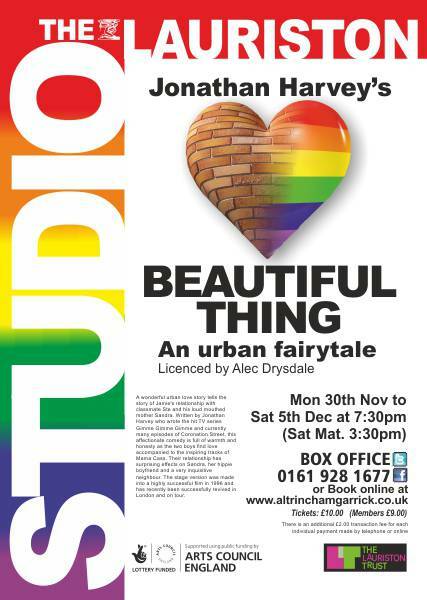 ?Written by Coronation Street writer, Jonathan Harvey and with a cast of just five, its all about love. ?16-year-old boys, Jamie and Ste, realising their attraction towards one another, are terrified of people calling them names such as ? queer?. ?One of these people is girl next door, Leah. She is street-wise and carries a torch for Ste even though he isn?t into girls. ?Alexandra O?Neill who plays her, conveys the fact that, although comparatively mature, she is still an adolescent with a crush on sole singer, Mama Cass. ?Unwittingly it is another key player, Sarah Roberts playing. Jamie?s mother, Sandra, who brings the boys together. Events happen when she invites Ste to share a bed with her son after his father has beaten him up ? and the inevitable happens. ?Roberts’ Sandra is portrayed as an extraordinary and charismatic character. She?s a flighty barmaid of the year character with numerous boy friends. ?Yet, despite the odd quarrel, she is still a good mum to Jamie demonstrating a different kind of love. ?In his first straight play rather than a musical Joseph Morgan plays Sandra?s boyfriend, Tony. ?As the writer intends, it is the boys who steal the show. Charlie Gallagher and Dillon Burgess point out precisely, the traumas of adolescence. ?They capture well the hesitancy and wonder of first love and convey the sensitivity about what other people think of them which is common to most teenagers. Well directed by Carole Carr this is a perfect cameo of life in a deprived area.